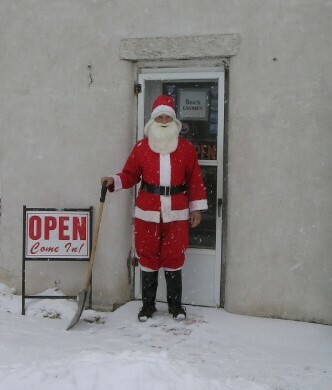 Santa and his dear Antique dealer friends, April, Cindee, Dave, JacE, John, Paula and Tami are always glad to have advance notice during the Winter! 7:30 AM Saturday morning February 9 Cindee Haddix of Abbott Antiques answered a call from York Nebraska. It is always a blessing when customers call ahead so we can turn on the heat prior to opening. Some antique locations are warmer because they are open all week long, some locations are heated by nature, some locations need to turn up the heat! Winter Time Shopping is enhanced when we have a chance to get the heat on! Thank you to the collectors from York that gave us a heads up!